PetroMaroc's Zag block is mostly located in occupied Western Sahara, partly stretching into Morocco. Most licences on this old map have by now been abandoned by the licence holders. PetroMaroc's licence is one of few left. PetroMaroc - and its ownership of the controversial Zag licence - has been taken over by another Canadian company"PetroMaroc Corporation (...) is pleased to announce that it has completed its previously announced arrangement", the small Canadian oil company PetroMaroc announced in a press release on 21 December 2018. The mentioned "arrangement" means that the company Wolverine Energy and Infrastructure Inc, also from Canada, has acquired all of the common shares of PetroMaroc. Western Sahara Resource Watch (WSRW) contacted Wolverine on 9 December 2018, enquiring about the takeover plans. WSRW has not received an answer to that letter. PetroMaroc, owns a minor interest on the Zag oil block in the northern part of occupied Western Sahara. Wolverine, based in Calgary, labels itself as a "full service geo-technical company" providing "diversified geological and engineering consulting services to upstream and midstream companies in the oil and gas, petrochemical and mining industries". No information is still available about the takeover on Wolverine's own website. WSRW wrote about the upcoming take-over on 30 November 2018. PetroMaroc has systematically referred to the licence as being located in "Morocco", which is not correct. 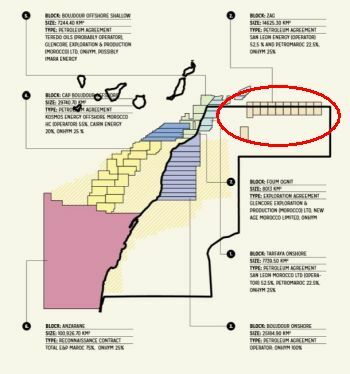 In 2011, PetroMaroc (or 'Longreach' as it was called at the time) and operator San Leon, misled a UK seismic services company, Spectrum, to undertake analysis of data from the block. "We do not want to get engaged in Western Sahara. I have no problem in stating, in retrospect, that it might have been a bad idea to take this assignment”, the CEO of the company told, underlining that his colleagues had not known the deal related to data from occupied territory. Also other companies have been lured in on false premises by other small operators, on Moroccan licences outside of Morocco's international borders. A complaint against San Leon's Zag operation was filed in 2018 to the National Contact Point of the OECD in Ireland for violation of the OECD Guidelines for Multinational Enterprises, as the company had not secured the consent of the Saharawis. San Leon and PetroMaroc have over the last years been in dispute with the Moroccan government regarding lack of progress in the exploration on their block. The UN secretariat stated already in 2002 that any further oil exploration in Western Sahara could not take place without first securing the consent of the people of the territory. Neither PetroMaroc nor the operator San Leon have made any such effort.